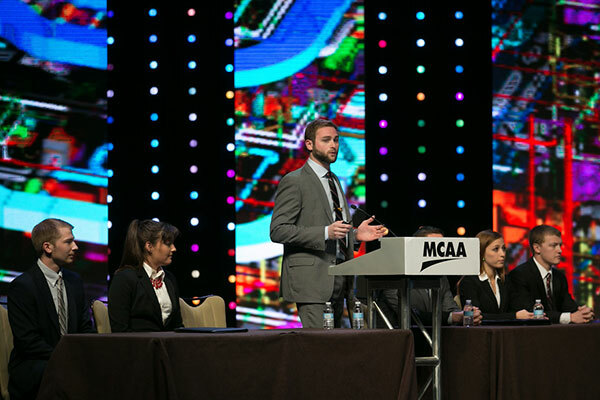 The MESC team listens as architectural engineering major Kevin McIntyre talks to the judges during the team's presentation March 23 at the MCAA National Student Design Competition in Orlando, Florida. The UNL team won the competition for the first time since 2006. 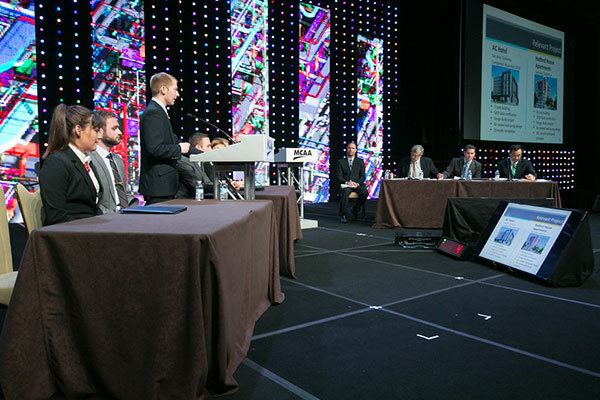 The MESC team listens as construction management major Peter Niechwiadowicz talks to the judges during the team's presentation March 23 at the MCAA National Student Design Competition in Orlando, Florida. The UNL team won the competition for the first time since 2006. 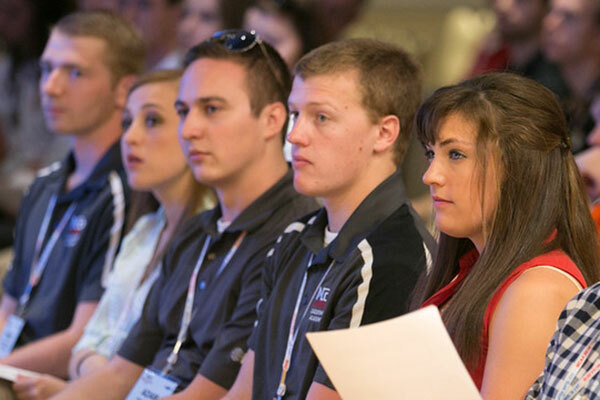 Members of the UNL MESC team - (from left) Peter Niechwiadowicz, Sarah Drummey, Adam Crnkovich, Tim Drake and Rose Gensichen - listen to a speaker March 22 during the MCAA conference in Orlando, Florida. 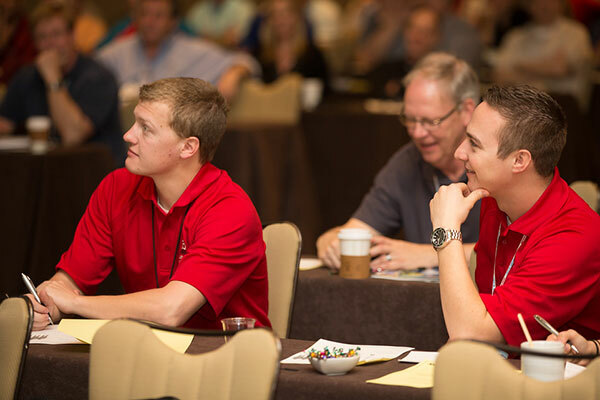 MESC student chapter members and construction management majors Tim Drake (left) and Adam Crnkovich listen to a presentation March 24 during the MCAA conference in Orlando, Florida. 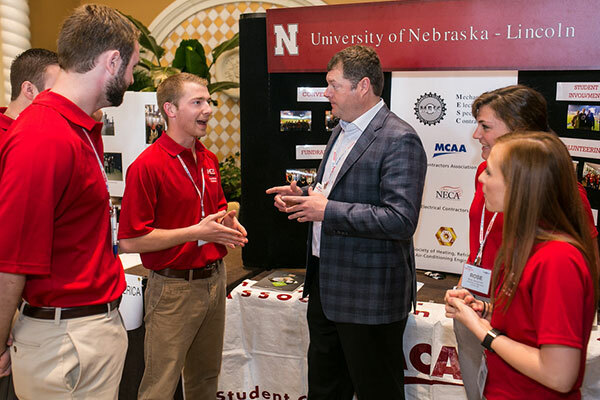 MCAA president Steve Dawson (center) talks with UNL construction management major Peter Niechwiadowicz and members of the MESC student chapter during the MCAA conference in Orlando, Florida. UNL architectural engineering major Kevin McIntyre talks to the judges as the MESC team presents its design at the MCAA National Student Design Competition. The UNL team won the competition and McIntyre won the $5,000 Foster McCarl Jr. Memorial Scholarship. 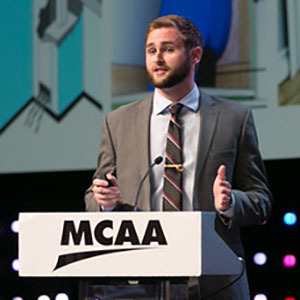 The UNL student chapter of Mechanical-Electrical Specialty Contracting (MESC) led a sweep of the major awards at the Mechanical Contractors Association of America (MCAA) conference March 22-23 in Orlando, Florida. The UNL team won the MCAA National Student Design Competition for the first time since 2006. Members of the UNL team were: construction management majors Peter Niechwiadowicz, Tim Drake, Adam Crnkovich and Rose Gensichen, and architectural engineering majors Kevin McIntyre and Sarah Drummey. The competition called for teams to create a plan – estimate, schedule, safety program, constructability review and value engineering, for a high-rise residential project in San Jose, California. In January, the UNL team was one of four chosen to present its proposal in the finals. McIntyre and Drake each took home one of the two $5,000 scholarships that were awarded. McIntyre was chosen as the winner of the Alan P. O’Shea Memorial Scholarship and Drake was chosen the recipient of the Foster McCarl Jr. Memorial Scholarship. With all that success, it was no surprise that the UNL MESC student chapter was named the national Student Chapter of the Year. The MESC team’s faculty advisor, Tim Wentz, was not able to be at the competition because of commitments to his position as president-elect of the American Society of Heating, Refrigerating and Air-Conditioning Engineers (ASHRAE). Blake Wentz, Wentz’s son and a UNL alum, not only stepped in to help the UNL team but was honored as the MCAA Educator of the Year. Wentz is chair of Civil Engineering, Architectural Engineering and Construction Management at the Milwaukee School of Engineering, and his teams had won two of the previous five MCAA competitions.